Remove a cluster from monitoring within the OpsCenter UI and Lifecycle Manager UI. Disconnecting a cluster from OpsCenter does not delete the cluster itself. 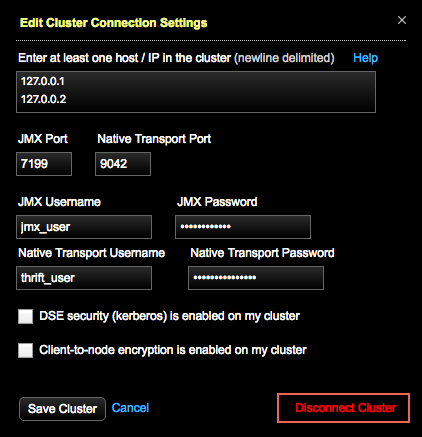 Select the cluster your want to delete from the Cluster list. A prompt requests you to confirm the delete. Click Disconnect to confirm removing the cluster from monitoring within the OpsCenter UI. The cluster and its datacenters and nodes are also removed from monitoring within Lifecycle Manager.